Yesterday the German ZEW Current Conditions came worse than expected and now all eyes are on the ECB meeting and Draghi’s speech. 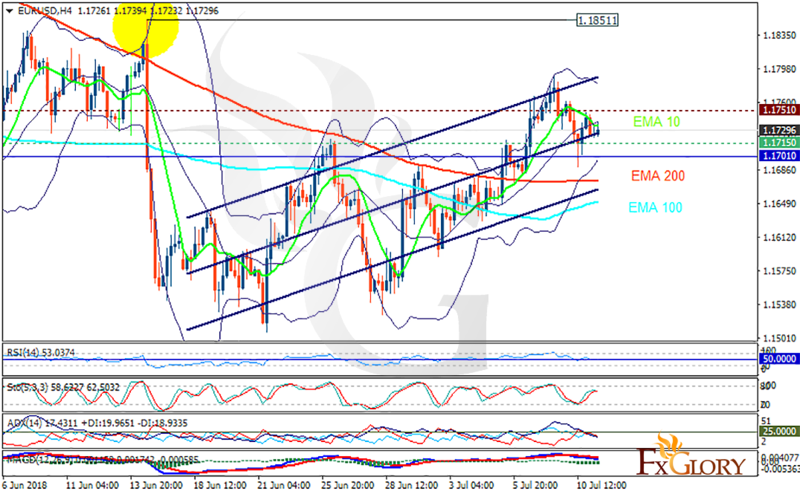 The support rests at 1.17150 with resistance at 1.17510 which both lines are above the weekly pivot point at 1.17010. The EMA of 10 is moving with bearish bias in the ascendant channel and it is above the EMA of 200 and the EMA of 100. The RSI is moving on the 50 level, the Stochastic is moving in middle ranges and the MACD line is below the signal line in the negative territory. The ADX is not showing any clear signals. The indicators are not showing any specific trend direction; considering the bullish trend, buyers can target the upper Bollinger band at 1.18.